Good evening fellow bloggers! 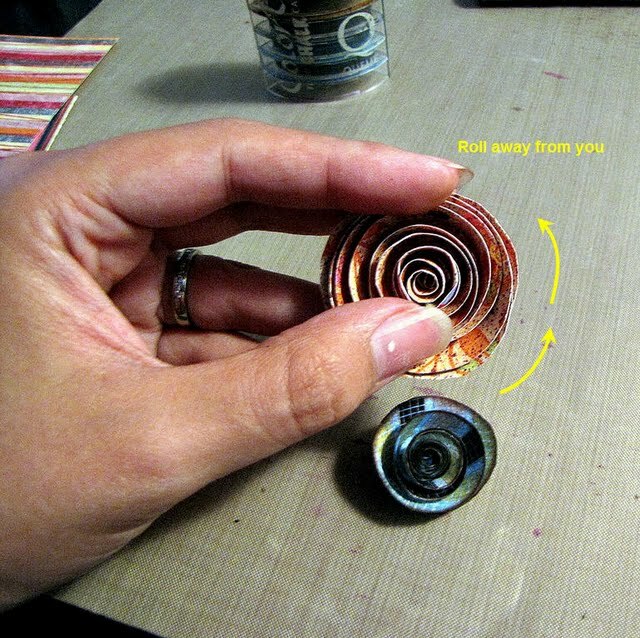 Today I'm going to take a few minutes to post a quick tutorial on how to make spiral flowers. I recently learned how to do this in a class I took at my local scrapbook store. During this class I made my very first canvas! I'll be posting this soon because I'm very proud of how it came out! These spiral flowers were part of the canvas. They're so very simple to make but yet make such a great statement on layouts, canvases, cards etc...In addition, I found that making these flowers is an excellent way to get rid of scraps! First your supplies...you'll need scraps of patterned paper in various square sizes. I've cut scraps into 2 1/2" inches x 2 1/2" inches & 4" inches x 4" inches for this tutorial. The bigger the square, the bigger the flower will be. Next you'll need scissors & some glue dots. The rest of the supplies (pencil, glimmer mist & chalk ink) are optional. These extra supplies are simply to add more pizzazz to your spiral flowers if desired. I'll be using all of these for this tutorial. This step is optional. Spray your paper with glimmer mist. You're not looking for perfection here--so just spritz away! I ended up using some Smooch as well on the yellow patterned cardstock. Once the paper has dried--cut out circles from the square pieces of carstock. Once again, you're looking for imperfect circles--so don't worry if your circles come out a little lopsided--lopsided circles give the sprial flowers more personality. 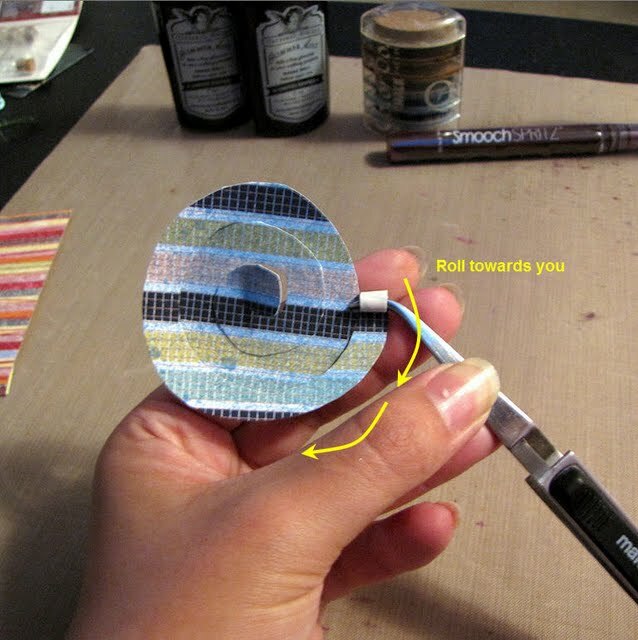 Here you can also use a pencil to hand draw your circle if you prefer & then proceed to cut out. Starting from the outside of the circle start cutting in a spiral fashion all around the circle until you get to the center. 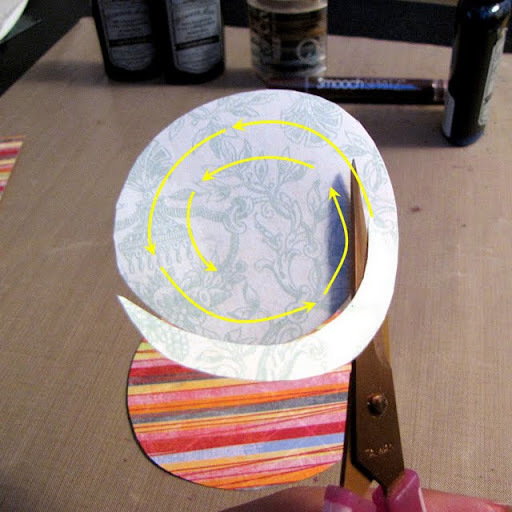 Do not cut the center of the spiral out--you'll be needing this later in order to glue the flower together. Also, try not to cut the spiral too thin. I learned this the hard way! When you cut the spiral too thin you end up with a very tight coil when you start twirling the flower & then it takes extra work to loosen it. In the end, this is what you should have. Notice that I did not cut the center of the flower out. This step is optional. If you want to define your spiral flower some more--ink it's edges with the chalk ink as shown here. Before beginning to twirl your flower make sure that the pattern you want to be the face of the flower is facing you. With a pair of tweezers take the outer tail of the spiral flower & begin rolling it towards you. This part is the only one that takes a bit of practice because you need to keep your thumb placed at the bottom of the spiral flower so it doesn't spring out of your grasp. Also, try not to coil it too tight or you'll end up with a very tight sprial--& then you'll have to work to un-coil it! Here's a screen shot of the flower after I've coiled it completely. I also wanted to show how I positioned my thumb in order to keep the flower from uncoiling itself. It helps though that I have very flexible thumbs as you can see here! My mom always makes fun of my twisty thumbs! Once you have coiled the flower completely, remove the tweezers. This is what you'll end up with. As you can see, I still have issues with how tight I coil my flowers! They look awfully tight don't they!? :-) No worries though...you just need to take extra steps to loosen the flower up a bit. This step is simply to un-coil the flowers a bit in order to loosen them up. You do this by twirling the flowers in the opposite direction--which would be away from you. Do this with both hands & use mostly your thumbs to uncoil the flower. Uncoil the flower to your liking. Once you're satisfied with the flower it's time to glue them in place. Take your glue dots & place them at the bottom of the coil which would be the center of your flower as shown in the screen shot. Once the glue dot is in place adhere the center of the flower to the glue dot. No need to glue the outside layers of the flower--all you really need to adhere is the center of the flower--once the center is adhered the rest of the flower will stay in place. Here you go--two spiral flowers in two different sizes. Hope you enjoyed this tutorial. I'll be posting my very first canvas soon! No wonder mine have been so difficult! I've been coiling them from the wrong end! Thanks so much for showing this!!! LOL! They are so pretty! Me encanta el tutorial Kay!! se ven hermosas y facil de hacer, gracias por compartir lo que has aprendido! Those are so cute! Thanks for sharing your process! Awesome tutorial ~!!! Yo make it look so easy! !